In 2017 I visited Malaysia for the first time, starting in Peninsular Malaysia with the legendary Kurt "Orion G" and ending in East Malaysia, a.k.a. the states of Sarawak and Sabah in Borneo. Well, that was the plan anyway. 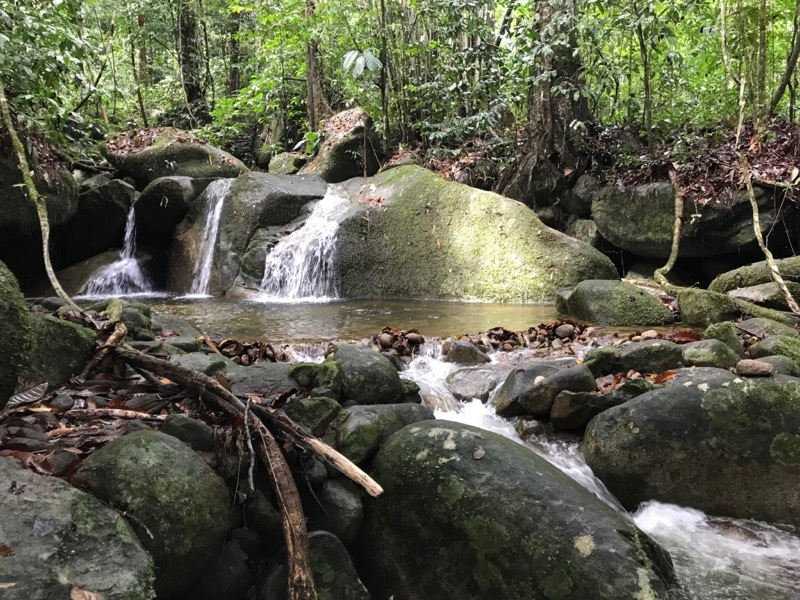 When I slipped on slimy wet rock in Bako National Park and tried to block my fall with my wrists, that plan and my wrist were both busted. So I soon came up with a new plan: to return to Borneo, finish my original itinerary, and add some new spots too. A year later, in February 2018, off I went. This time (spoiler alert!) I completed my trip with no intervening medical emergencies, so that's something. I flew into Kuching and was met at the airport by the legendary Hans Breuer (so many legends in this part of the world!). We enjoyed a fine meal at a "Pakistani Muslim Biker joint" (Hans's description) and drove around for a few hours telling each other stories while looking for herps on the road, of which there were none. Oh well, it was really just an excuse to finally meet Hans in person, and finally eat my first durian. Yum! 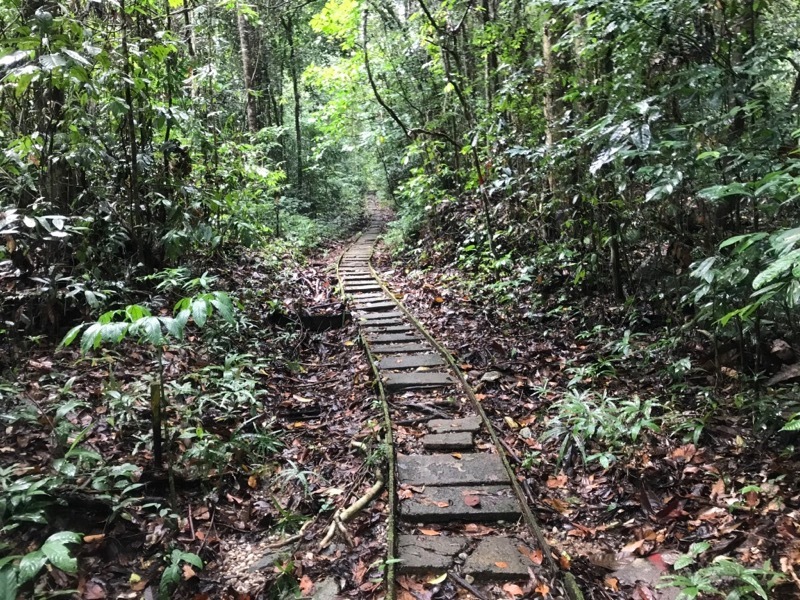 I divided the rest of my Kuching time between Kubah National Park, which I had visited the previous year, and Gunung Gading National Park, which I had not. I rented a car in Kuching to get between these spots, which was convenient and worked out fine. For this part of my trip I was traveling alone. I've mixed together the photos from these two parks to avoid making this account even longer than it will already be. Streams dotted with ponds flow hither and thither. 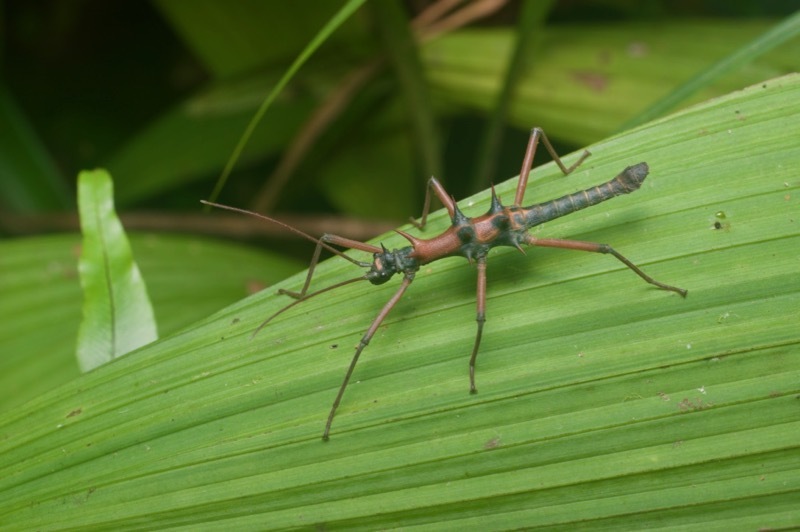 As is also true on the rest of the planet, most of the animals are invertebrates. 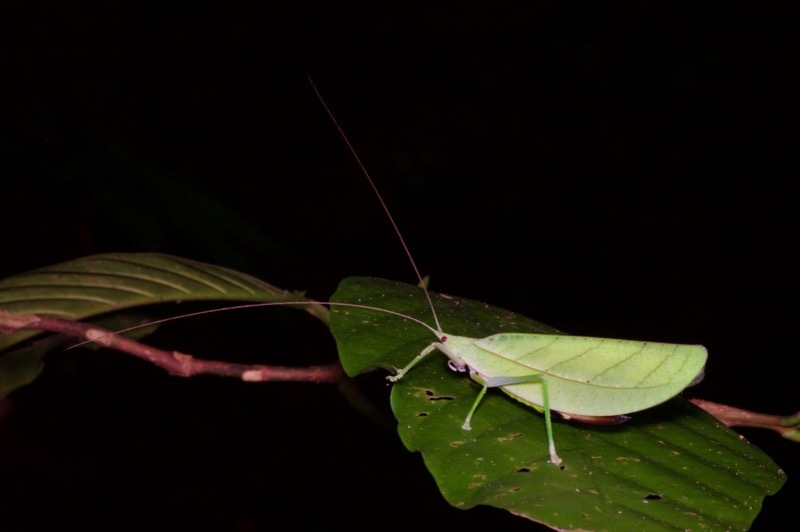 The Borneo rainforest has some very fine invertebrates, so I'll start each of my posts with a smattering of the spineless. 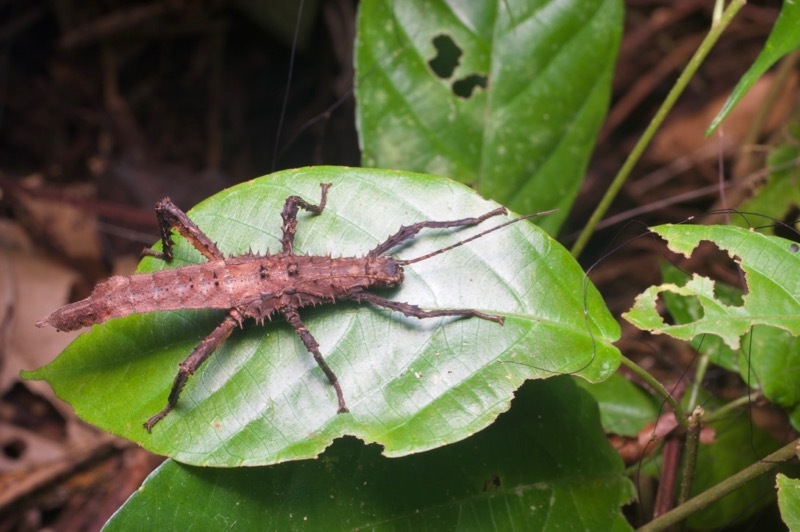 Borneo is a hotspot of diversity for stick insects, a.k.a. 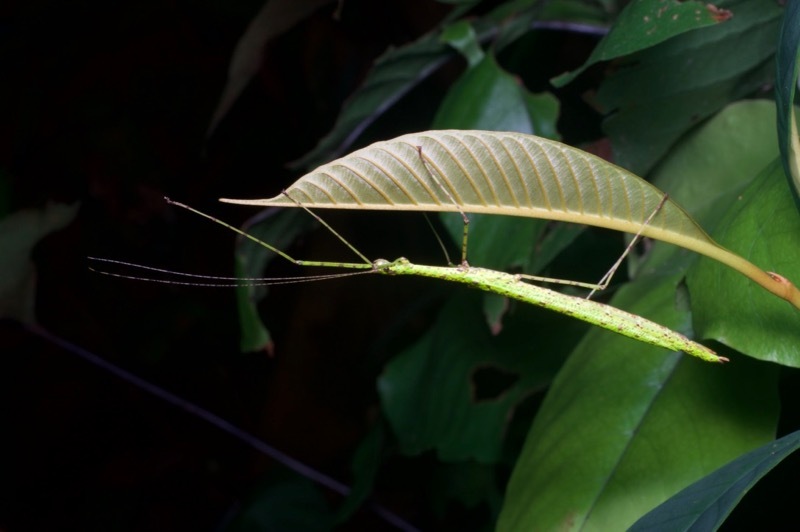 phasmids. 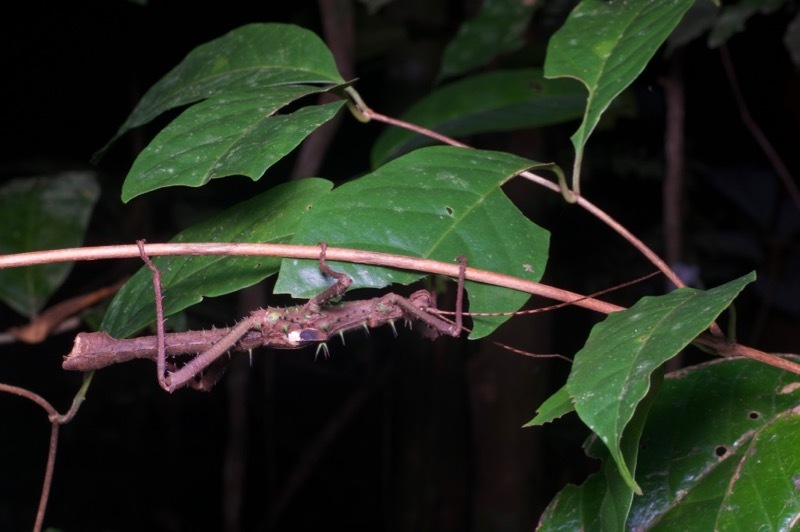 I tried to photograph every different type of stick insect I came across. 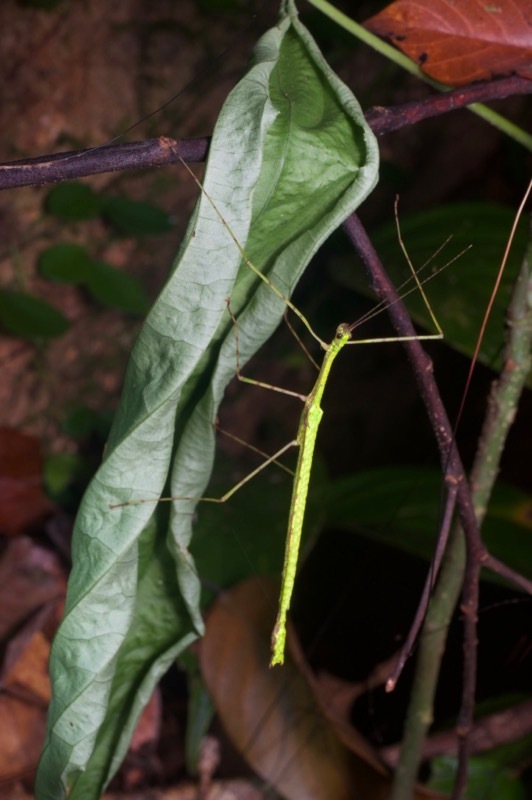 I'm sure I didn't succeed at that, but I definitely succeeded at photographing hundreds of individual stick insects. 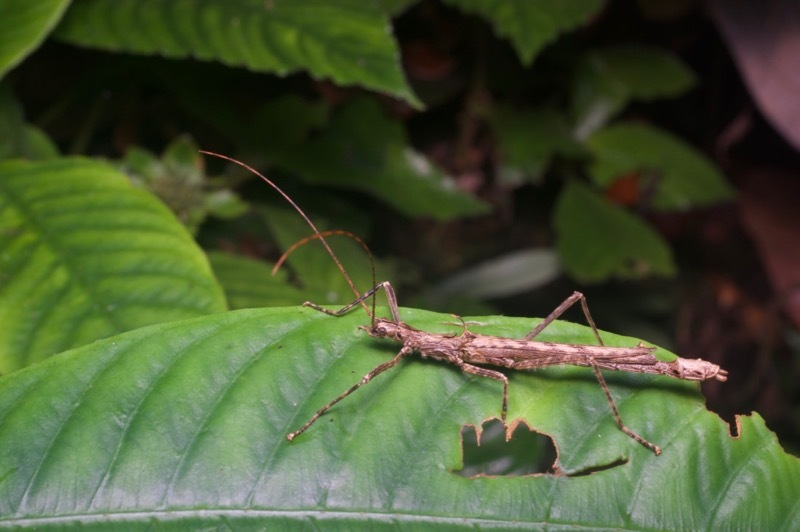 Some day when I have a few months with nothing to do I'll try to identify the species, but for now, here are a few of my favorite unidentified phasmids from the Kuching area. 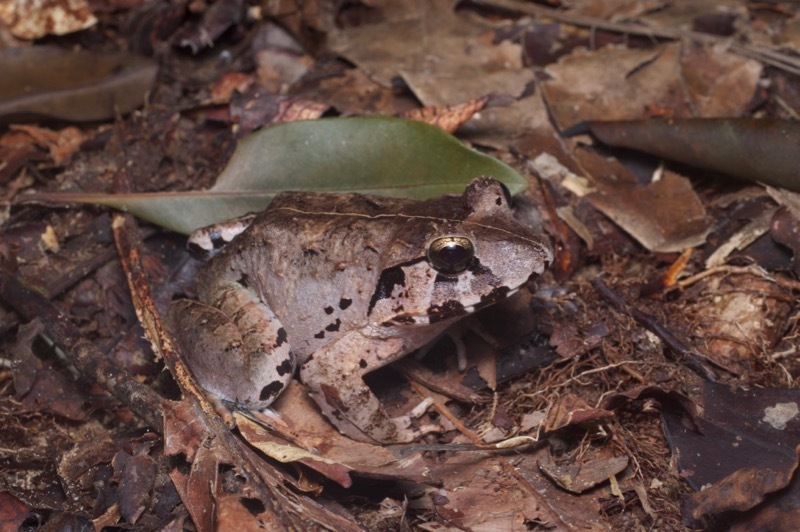 Last year at Kubah I had been very happy to find a Malayan Horned Frog. This year, within twenty minutes of leaving my lodging on my first evening, I found another. It was the first frog i saw at Kubah. 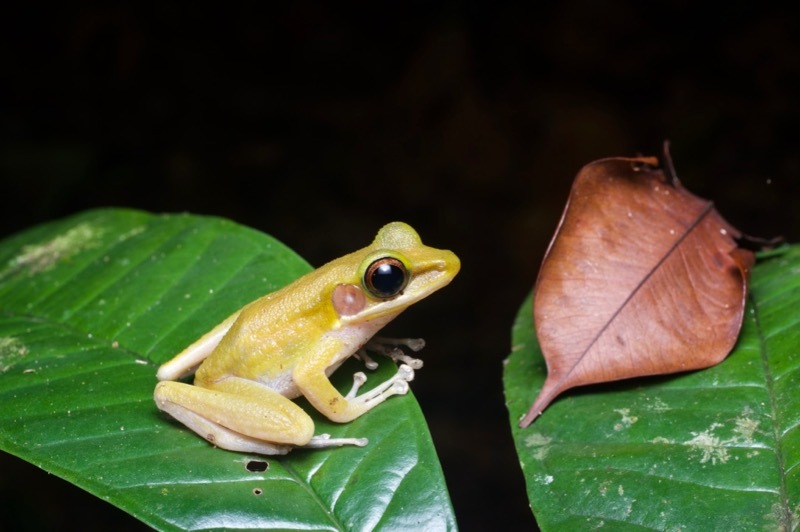 A few days later, the first frog I saw at Gunung Gading was another of the same. 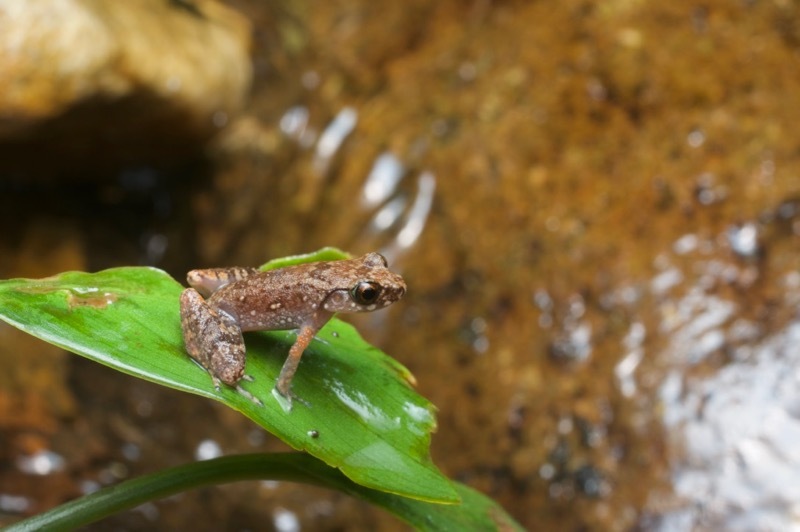 In both parks I found several tiny Mjoberg's Dwarf Litter Frogs calling near water. I believe these are the smallest frogs in the area. 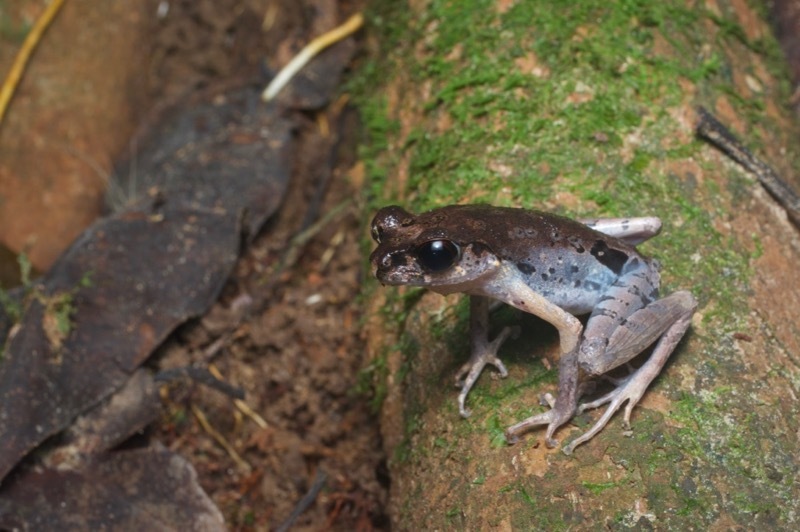 Leptolalax is/was a set of leaf-litter-dwelling frogs closely related to that Leptobrachella mjobergi. They are much larger, though still small at an inch-and-a-half or so. There's a movement afoot to lump these two genera together into Leptobrachella. 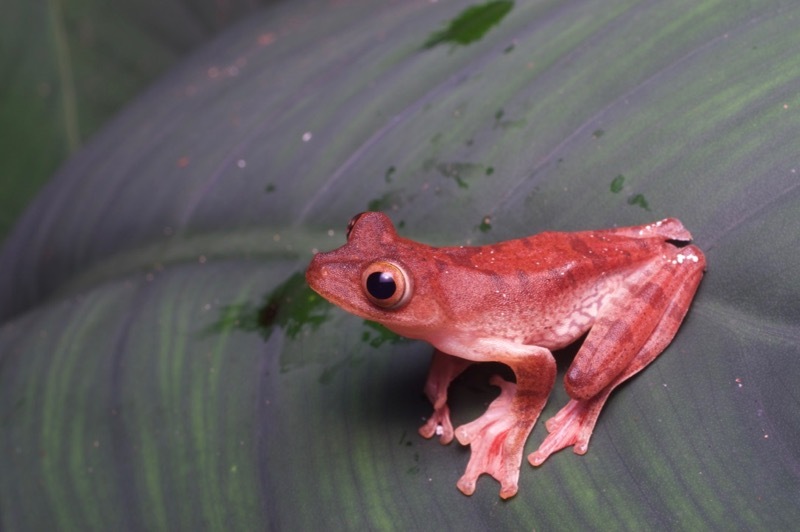 Meristogenys are small-to-medium terrestrial long-legged jumpy frogs that are difficult to distinguish. I'm thinking this one is Meristogenys jerboa primarily due to the dark snout and dark highlights around the tympanum and such. And I'm thinking that this one is Meristogenys penrissenensis primarily due to the significantly lighter color in various places. 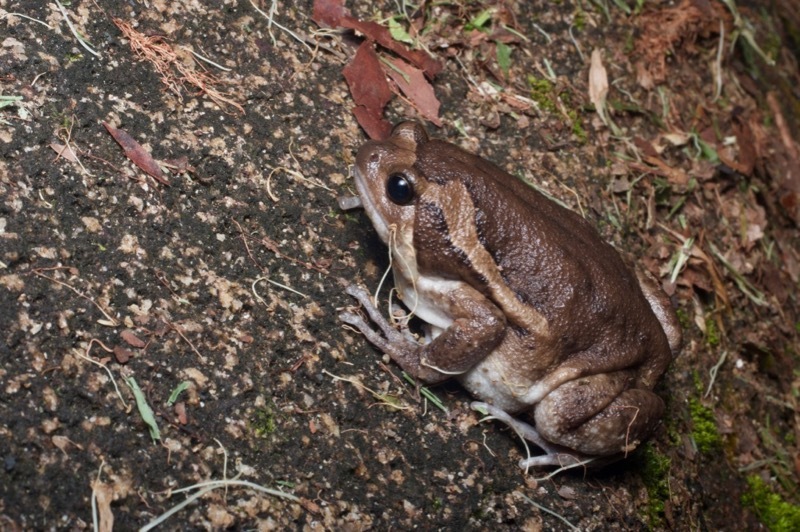 The leaf litter also housed several very large frogs, which were not as jumpy as the Meristogenys but could get very far away very quickly should they be disturbed. 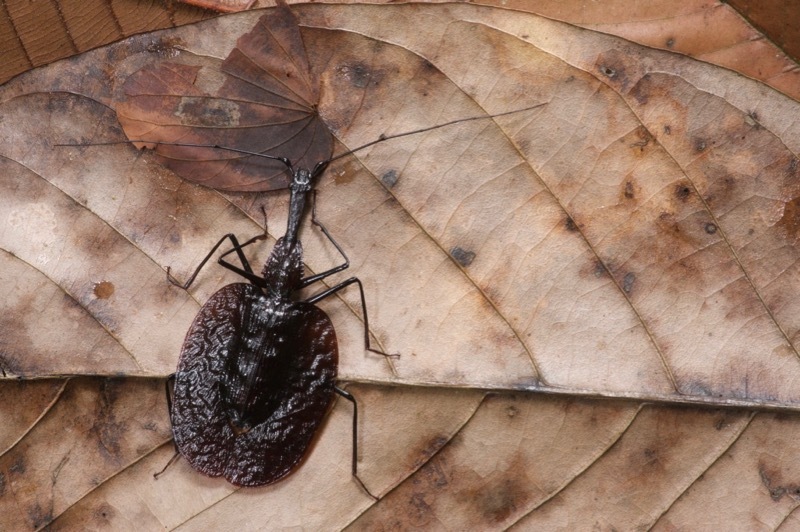 Various other Limnonectes species lurked in the shallower creeks and ponds. 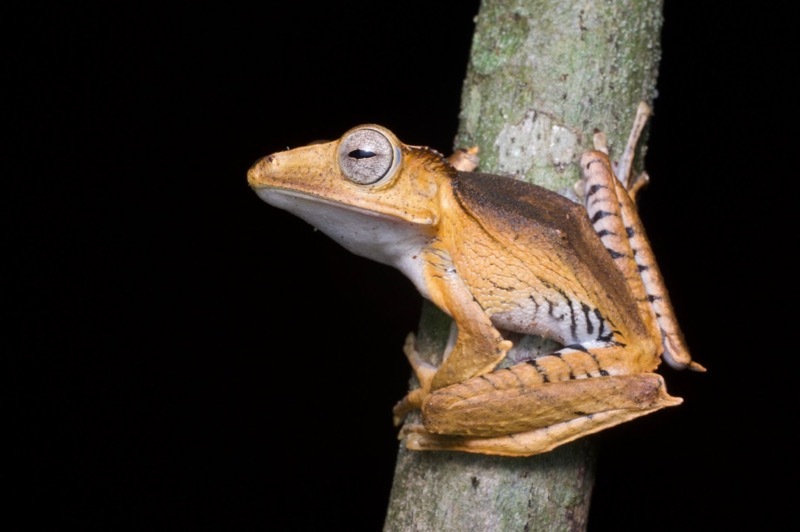 These used to be all lumped together into a species complex called Limnonectes "kuhlii", but recent studies in various Southeast Asian locations have been disambiguating a bunch of formerly-lumped species. 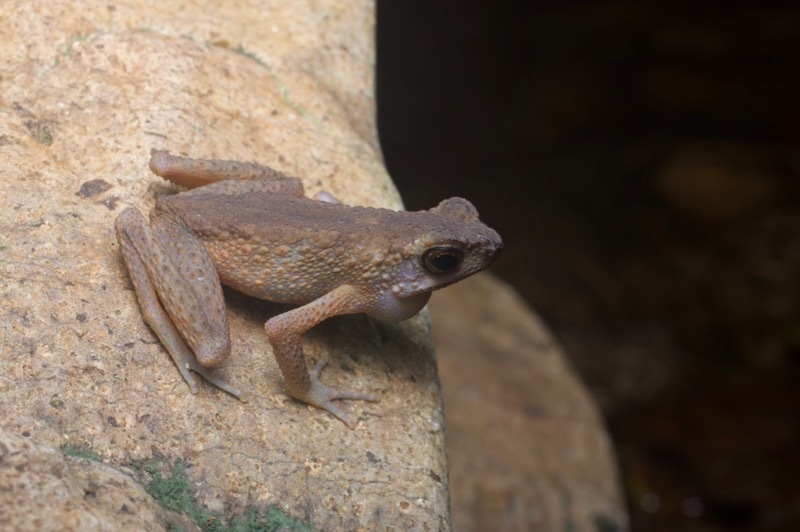 The areas near Kuching seem to be particularly well-studied, perhaps due to ease of access, so now you have at least three similar-looking Limnonectes species to pick from in this area when trying to identify these fairly generic creek frogs. Progress! 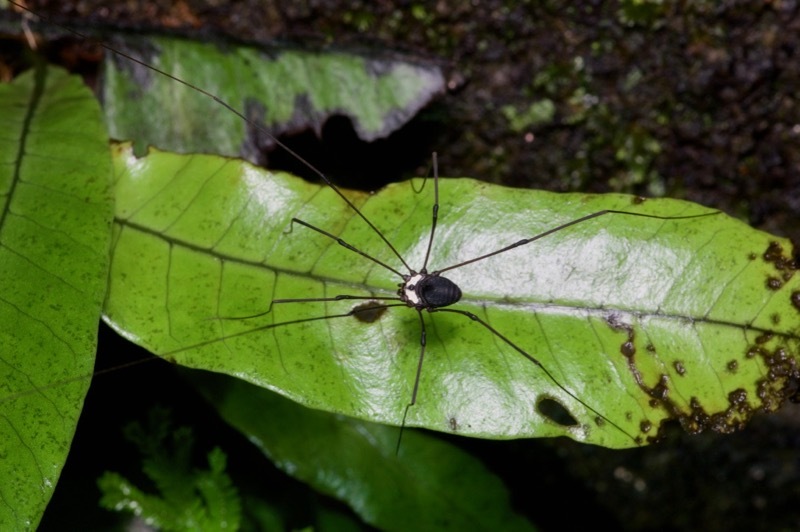 I think this one is Limnonectes hikidai due to its relatively little toe webbing, among other equally-obscure reasons. 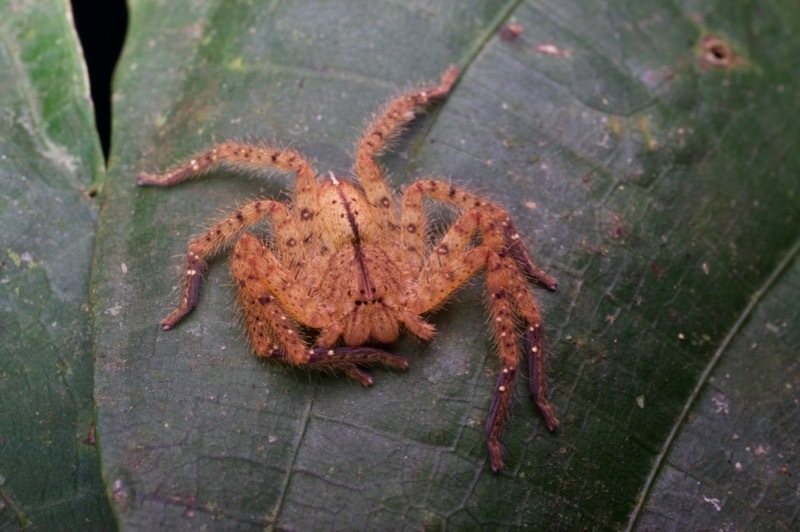 I think this one is Limnonectes conspicillatus due to its relatively more expansive toe webbing, etc. 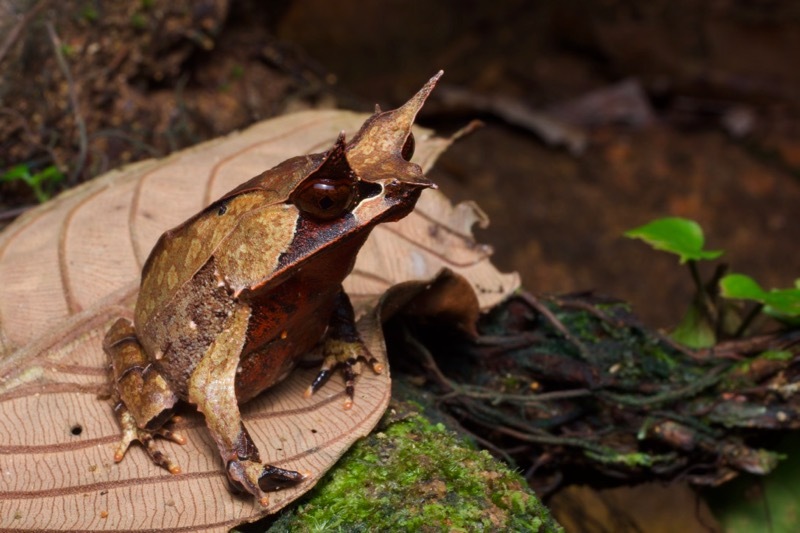 Weirdly-shaped animals are always more fun than non-weirdly-shaped animals, so I have a soft spot for Asia's Slender Toads. 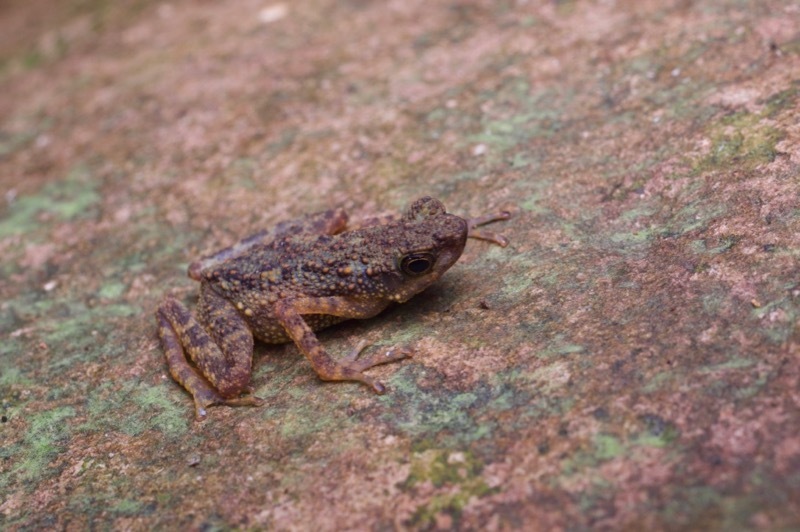 I believe this little bitty one is a Dwarf Slender Toad. 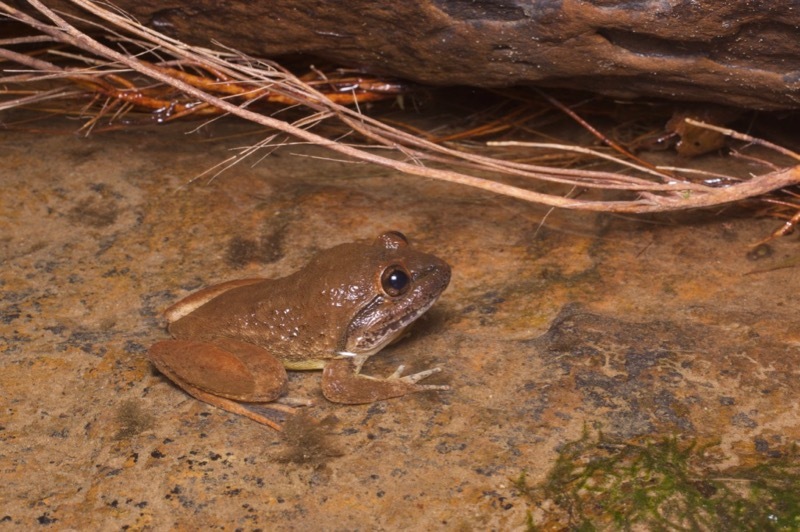 Males of the larger but no less weird-looking Brown Slender Toad like to call from the banks of rocky streams. 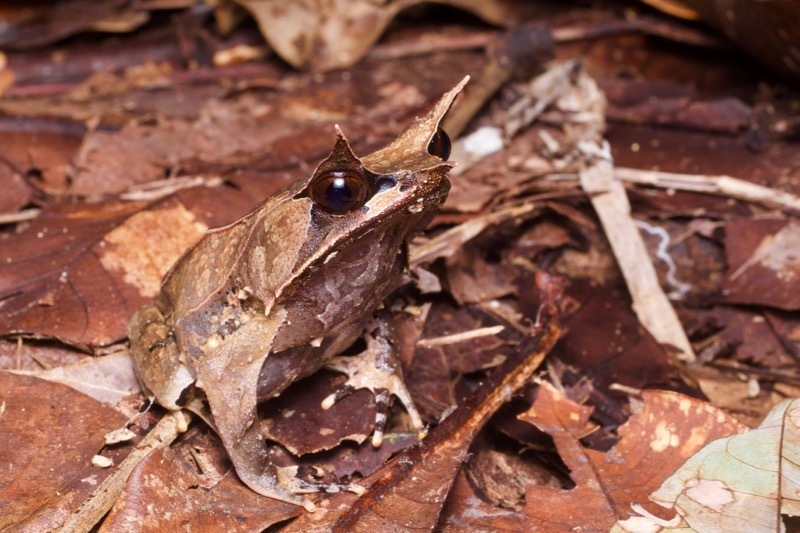 This blob of a frog resembles a toad at first glance but is actually a microhylid. 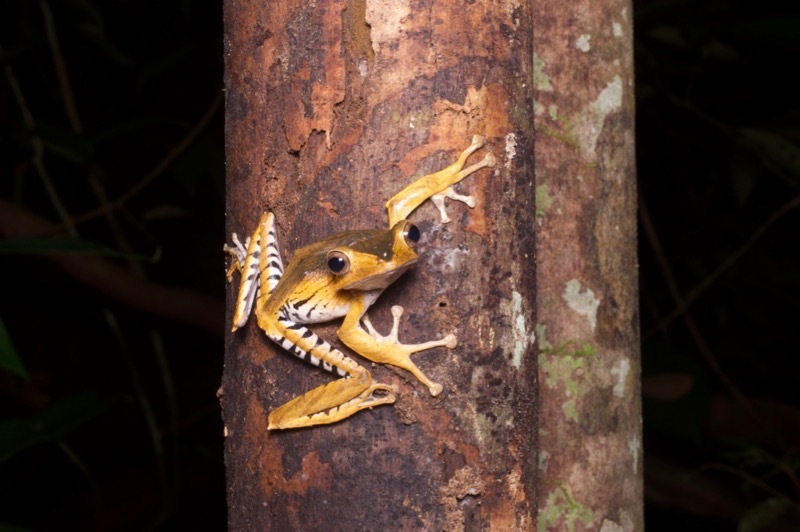 The species is believed to have been accidentally introduced to Borneo fairly recently, where it is thriving in urban areas. 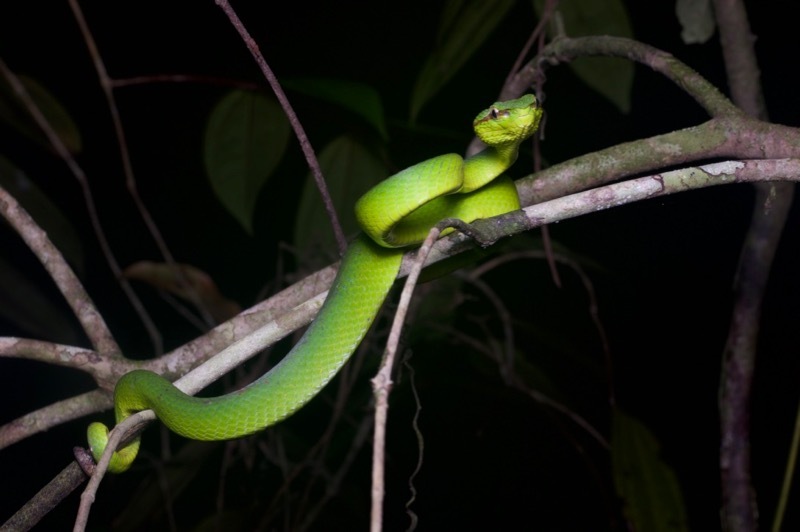 I only saw this one, which was patrolling the artificially-lit zone around the workers' quarters at Gunung Gading. 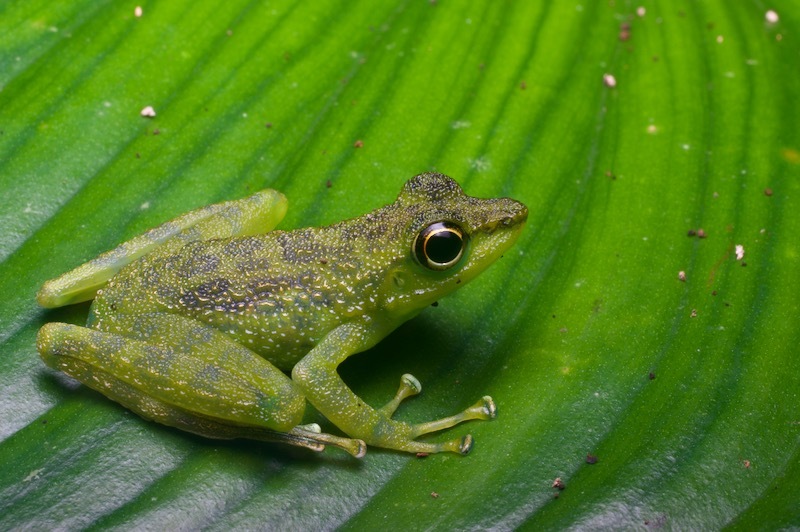 Hylarana raniceps (a.k.a. 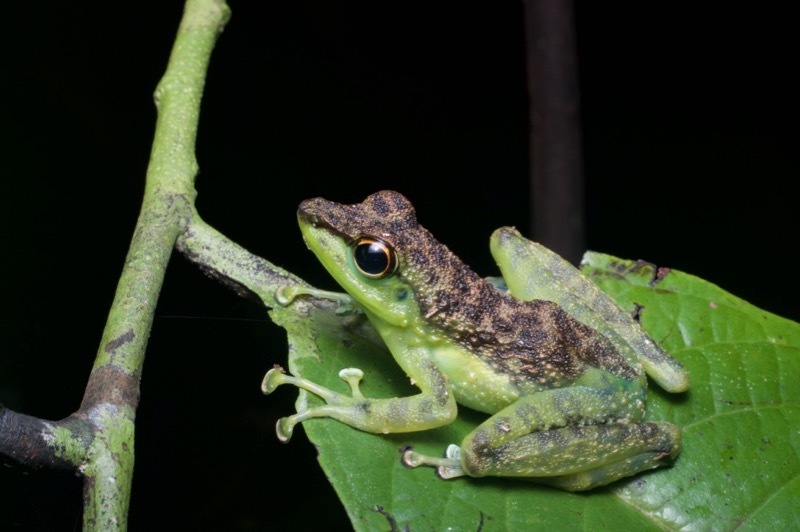 Chalcorana raniceps) is a general-purpose frog, happy on the ground, in or near water, and up in the vegetation. 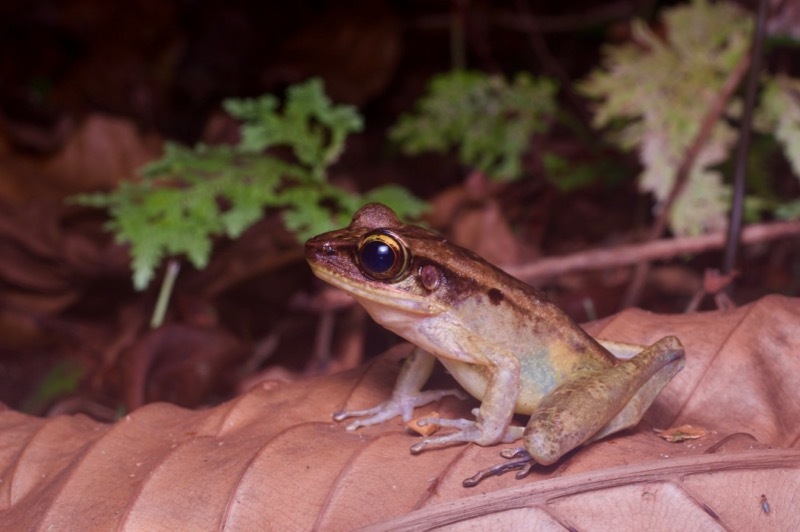 Among the best Borneo frogs are the Rock Skippers a.k.a. 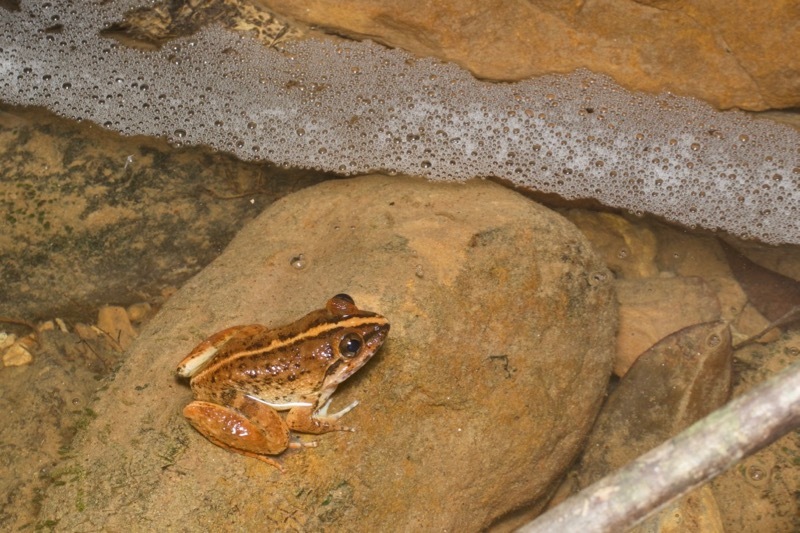 Foot-flagging Frogs, which generally hang out on rocks near or in fast-moving (thus loud) water, communicating with each other by humorously waving their feet around. 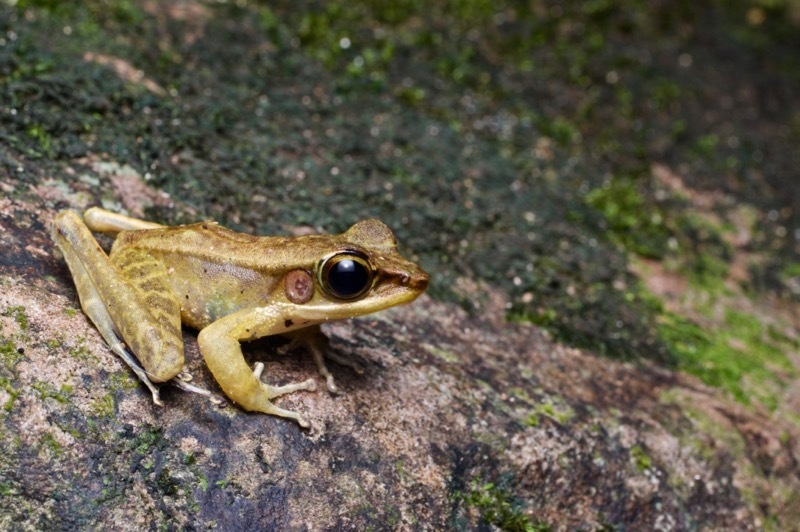 When disturbed they go leaping away, "skipping" from rock to rock in an instant. Well, that's what they do by day anyway. By night they rest in vegetation near that aforementioned fast-moving water, and are generally very cooperative with photographers. 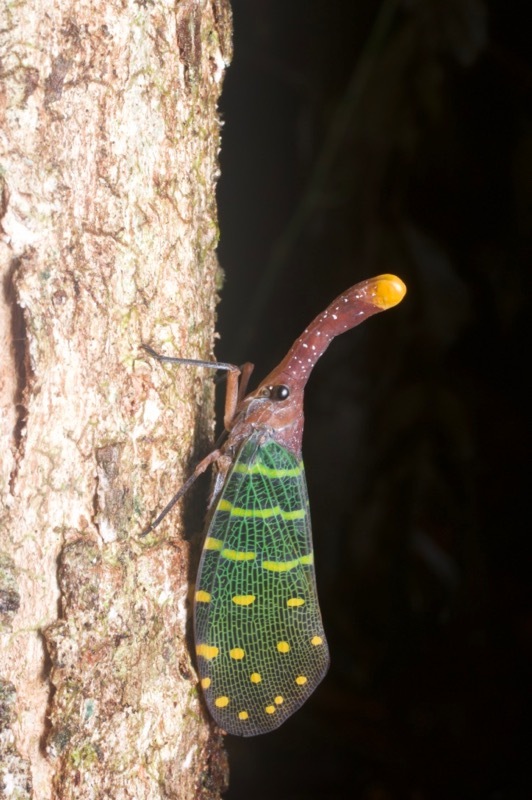 Several species live in Borneo, some more of which I saw later on in this trip. 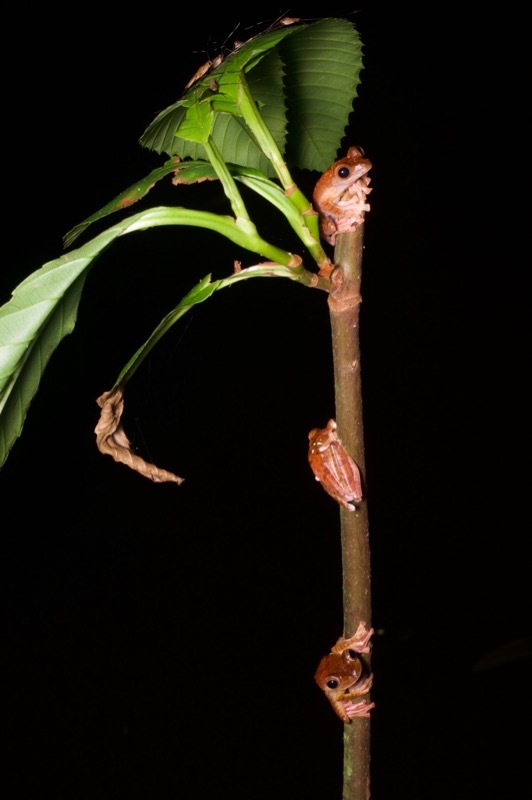 The most easily found frogs in Kubah are the Harlequin Flying Frogs. I saw a dozen or two of these each night. 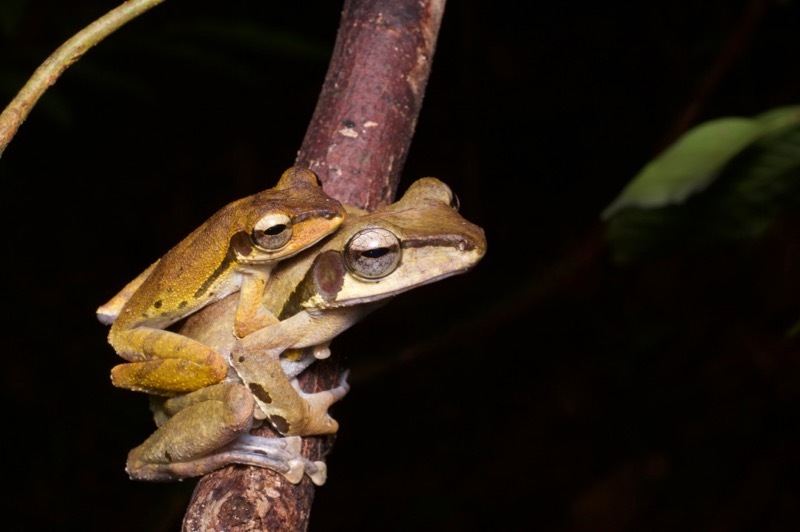 Also quite common are several Polypedates species, including Polypedates macrotis, illustrated here by a happy couple. 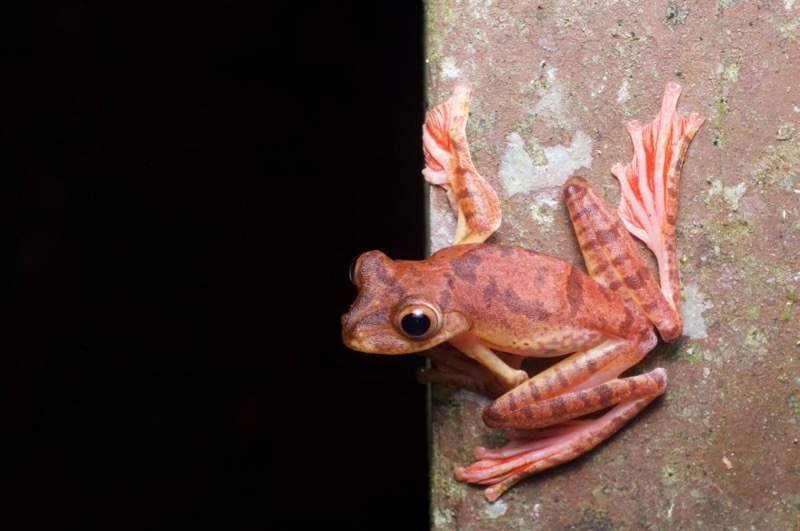 By far the best of the Polypedates is the spectacular Polypedates otilophus. These were also quite common, but you can never tire of seeing them. 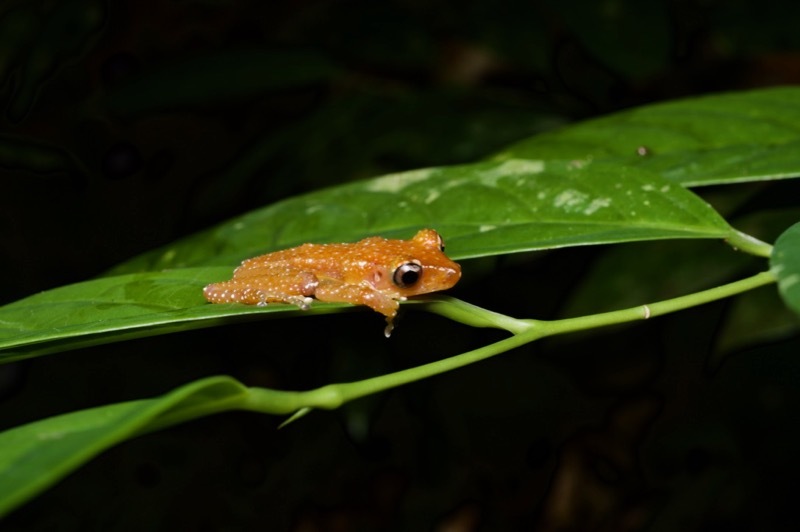 To keep this account to a reasonable length I'm not going to include photos of every frog species I saw, but here's one more good one, the cute l'il Cinnamon Frog. 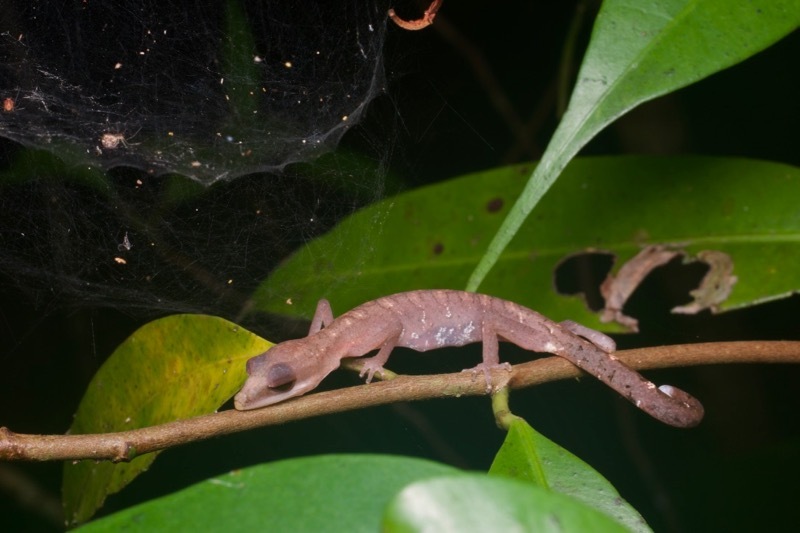 Borneo has an excellent variety of gecko species to keep you on your toes at night. 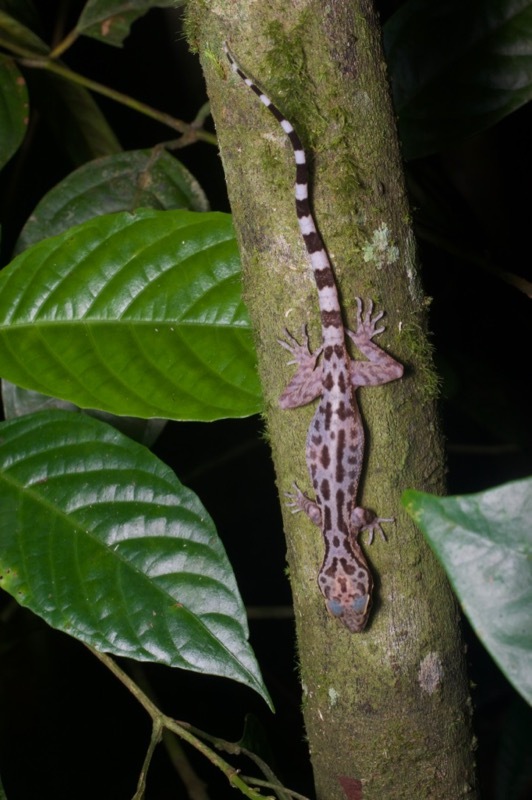 Most areas have multiple Bent-toed Gecko species (Cyrtodactylus), some of which are easy to tell apart and some of which aren't. I'm pretty confident that this sleeping beauty is Cyrtodactylus pubisulcus. 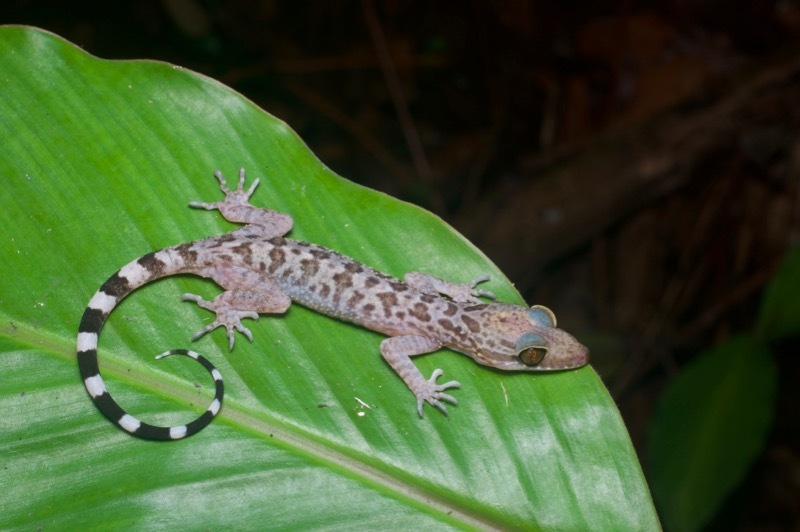 I think that the way the spots on this gecko almost coalesce into longitudinal stripes means that it is Cyrtodactylus quadrivirgatus, though I wouldn't be shocked to learn that it's another Cyrtodactylus pubisulcus. 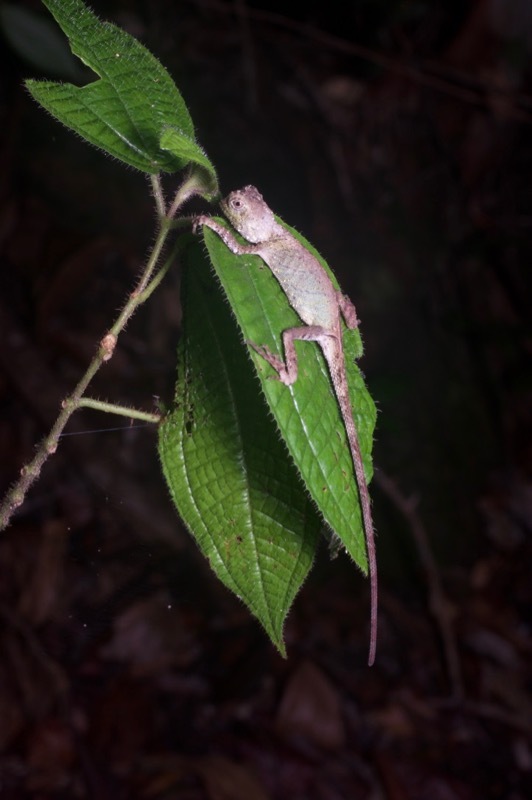 This big one is definitely Cyrtodactylus consobrinus, at least until someone splits the Borneo populations from the mainland populations. 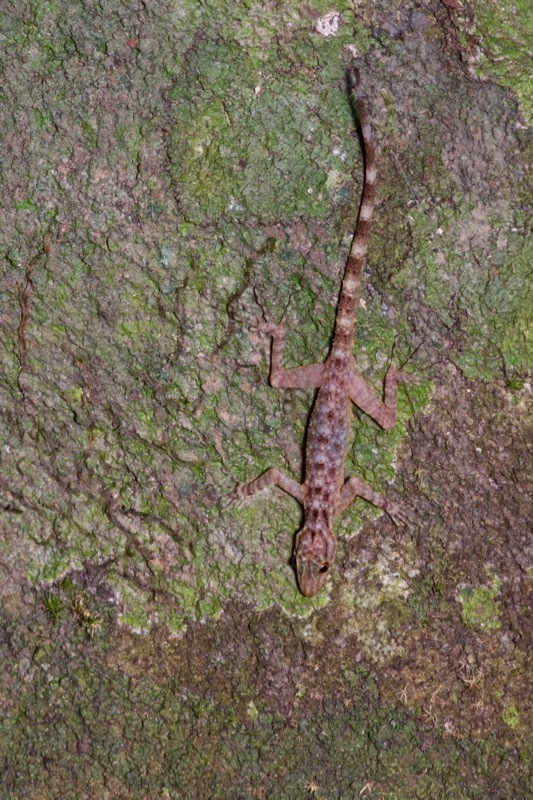 A couple of species of Rock Geckos (Cnemaspis) reside in Gunung Gading, but I only saw the common one, Kendall's Rock Gecko. The weirdest and thus probably the best gecko in this area is the Cat Gecko. I hadn't seen any the previous year, so this was my first lifer of the trip. 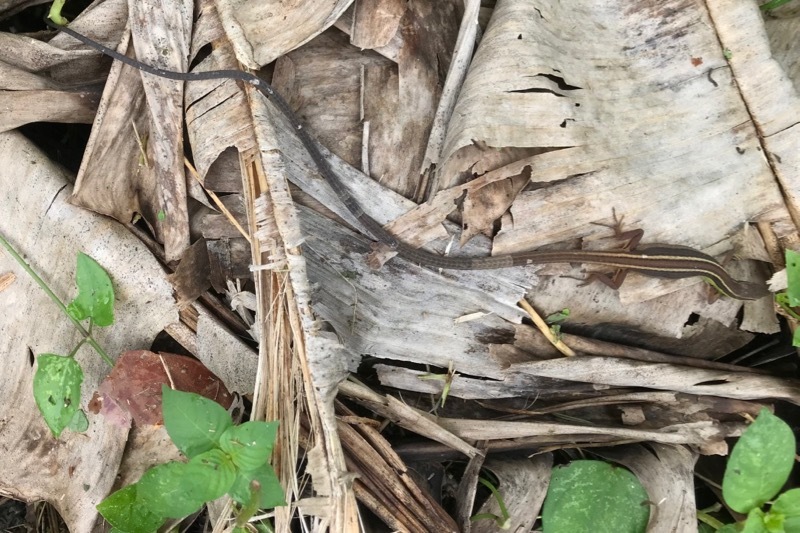 I only got this one photo because when I moved in a little closer, the gecko fell to the ground and somehow disappeared into the leaf litter. I say "somehow" because these geckos are famous for their slow-motion movements, and I did take some deserved abuse from Kurt when I told him I lost my first Cat Gecko after only one photo. 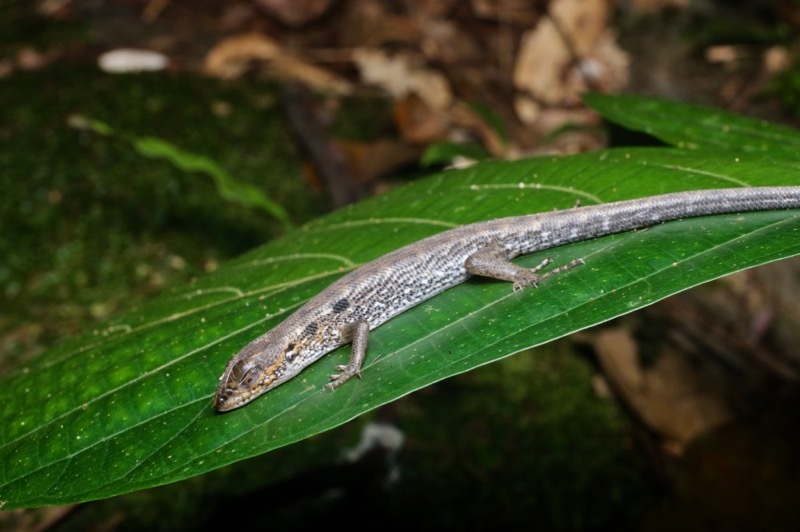 Tropidophorus skinks are generally busy scuttling about near water during the day. 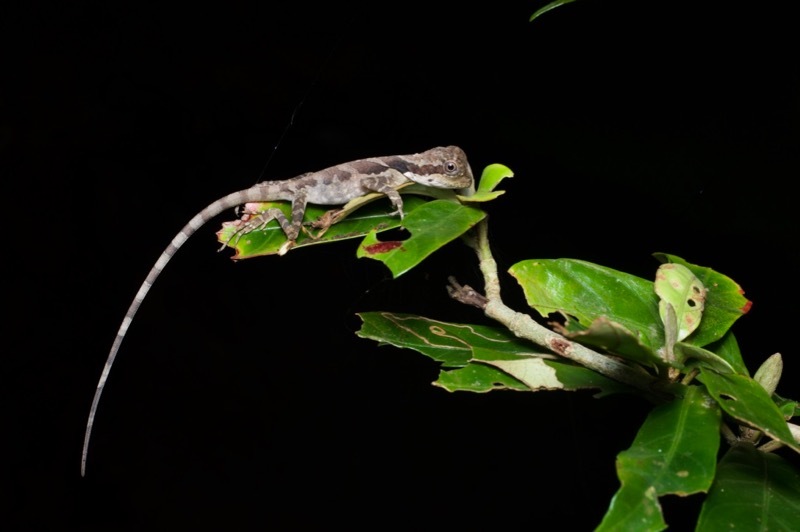 They are faster than Cat Geckos, but not the swiftest of skinks. This sleeping fellow wasn't going anywhere though. 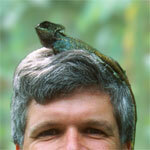 Shrub Lizards a.k.a. 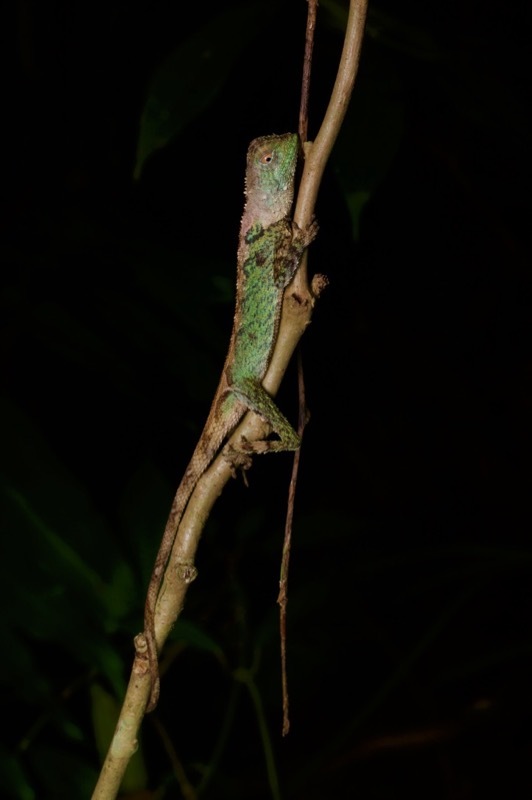 Eyebrow Lizards (don't ask me) are said to spend their days in low vegetation hunting for insects. 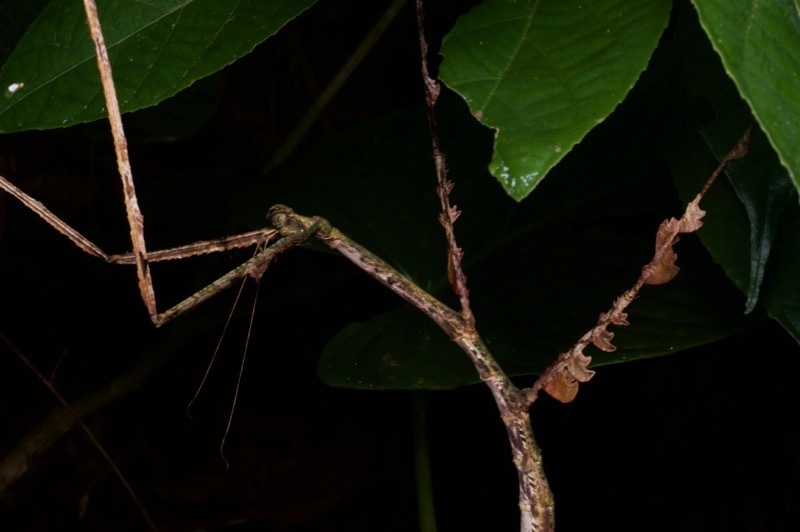 I wouldn't know, because I have only seen them at night, sleeping on leaves and twigs. This agamid was small enough to be a young Shrub Lizard, but was in fact the tiniest baby Great Angle-headed Lizard that I've seen. I didn't see any of the oh-so-grand adult males on this trip, just youngsters and adult females. 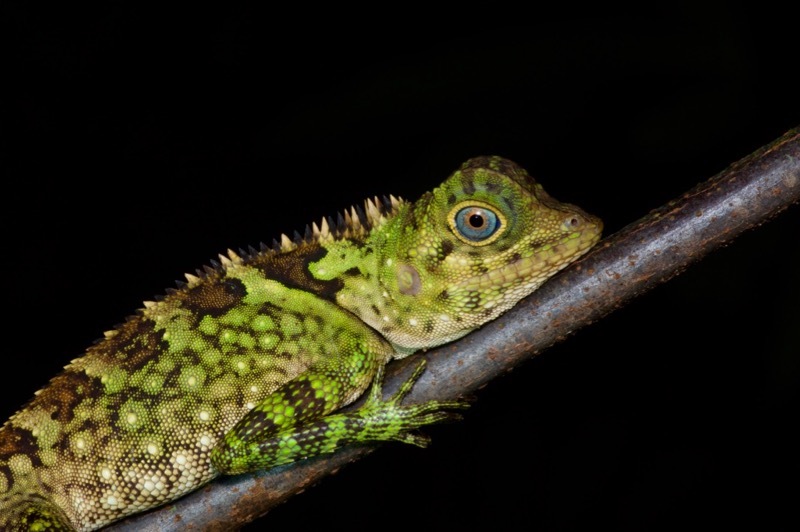 Another agamid species, and another youngster: this is an eye-catchingly bright Doria's Angle-headed Lizard. Sometimes they are bright orange, but I only saw a couple of bright green ones this year. 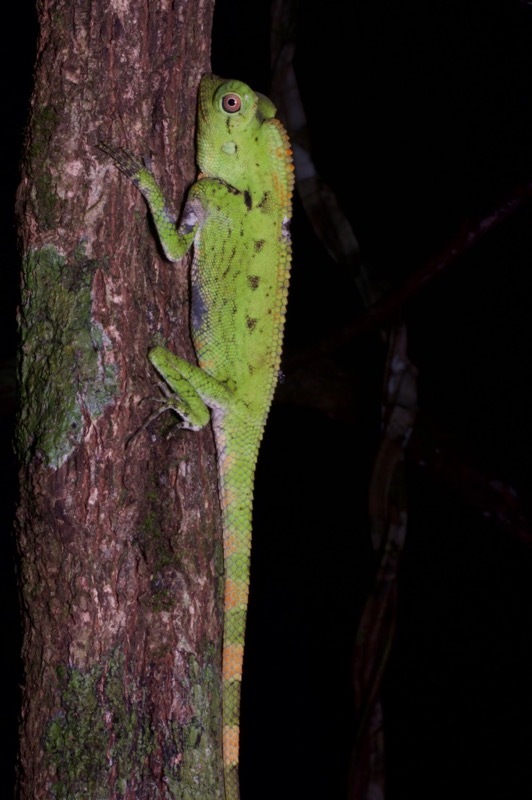 Blue-eyed Angle-headed Lizard (Gonocephalus liogaster), subadult male. Its eye is starting to turn blue; adult males have startlingly blue eyes. 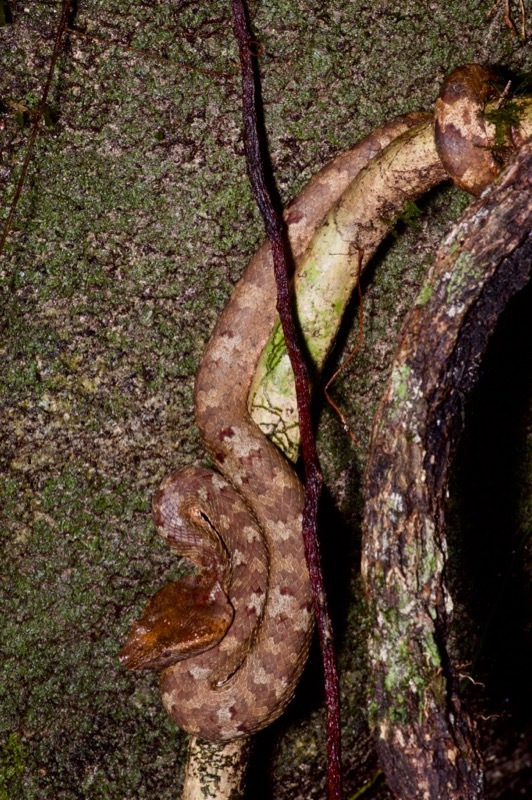 Borneo contains only one species in the family Lacertidae, but it's a crazy one. 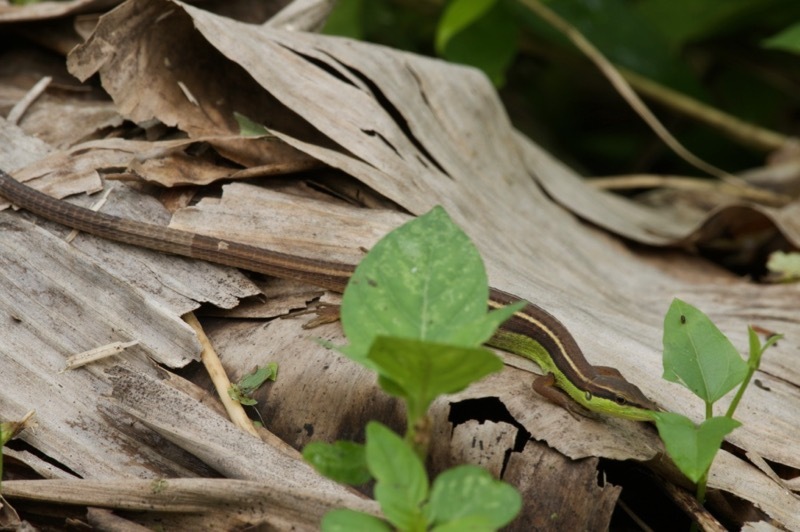 I spotted this Asian Long-tailed Grass Lizard in some dry palm fronds along a road. 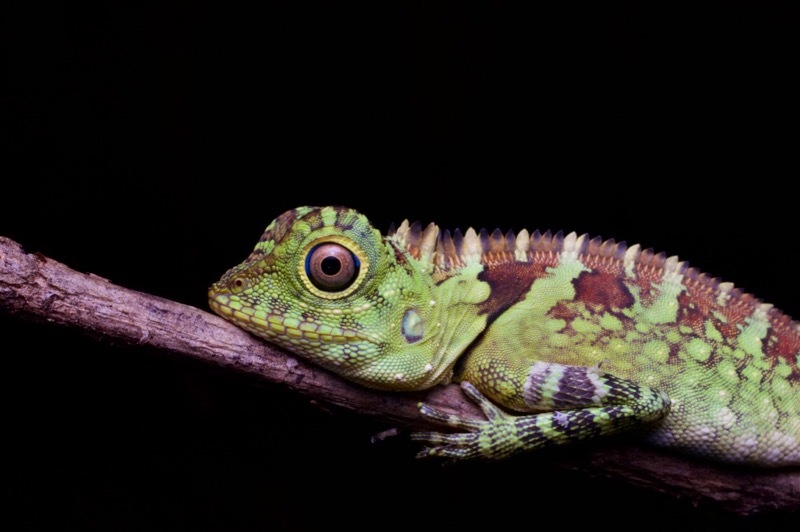 This is an unreasonably constructed lizard. 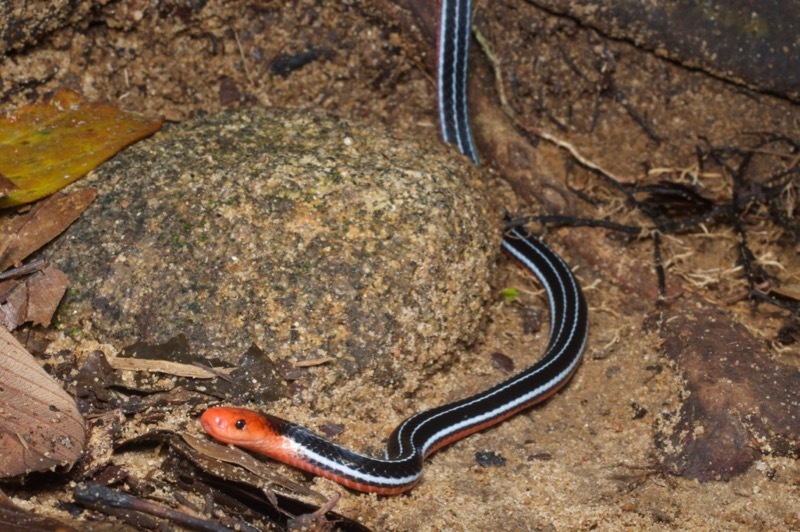 My next venomous snake was much less colorful but much harder to find and thus more exciting. A pair of Violin Beetles in a tree hole had caught my eye, and when I then turned my head a bit to the side I noticed this snake hanging in ambush position a couple of feet away. 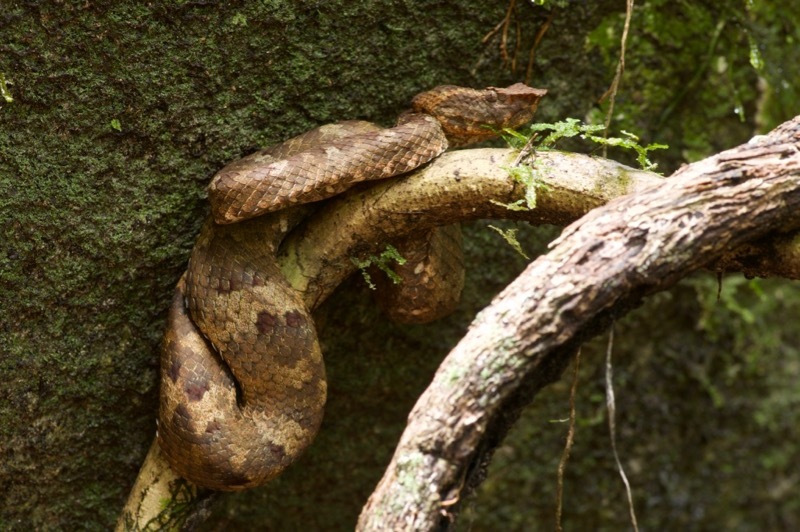 I later visited the same spot during daylight hours, to find the snake in a more comfortable-looking resting posture. Late one night I was hiking up a sloping trail when movement up ahead drew my attention. 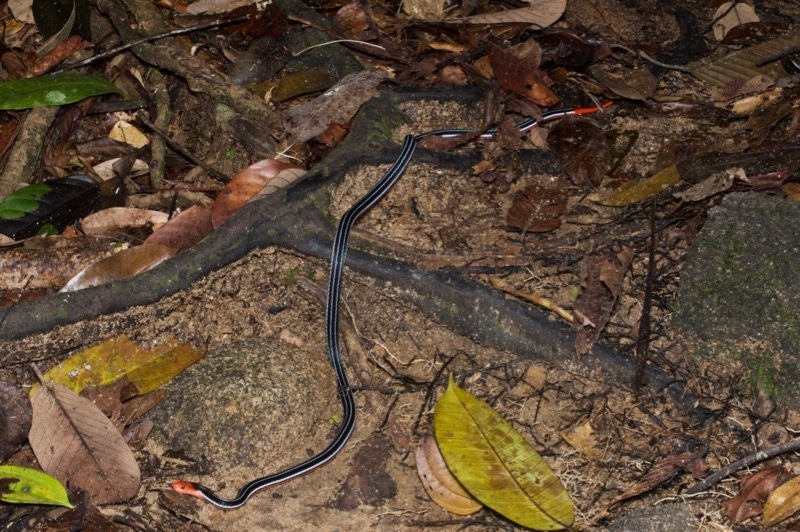 Coming down the same trail, faster than I was going up, was one of your more well-known Borneo elapids heading right toward me. I took a few bad pictures as it was moving down the trail. My trip was off to a good start, and I knew it would only continue to get better because at my next destination I was to be joined by my eagle-eyed friend Kurt. I'll try to get the next part written up soon. Great post, John. 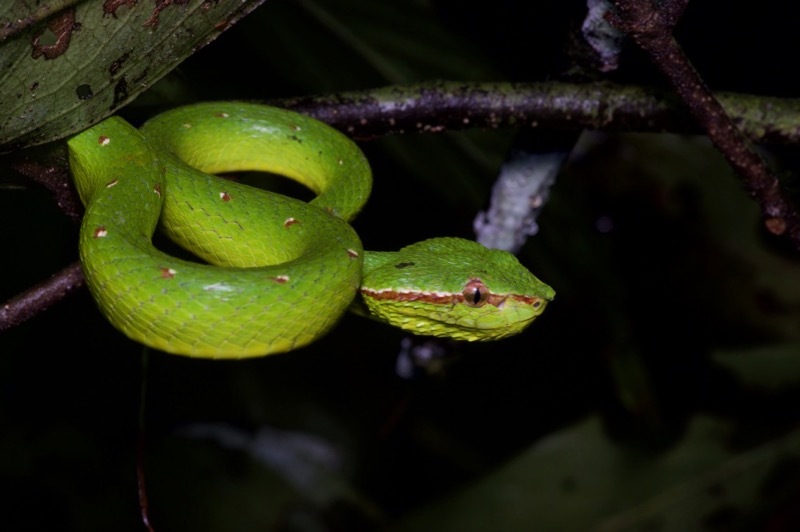 You have no idea how green with envy I was with your Gonocephalus doriae, Calliophis bivirgatus and Trimeresurus borneensis finds . 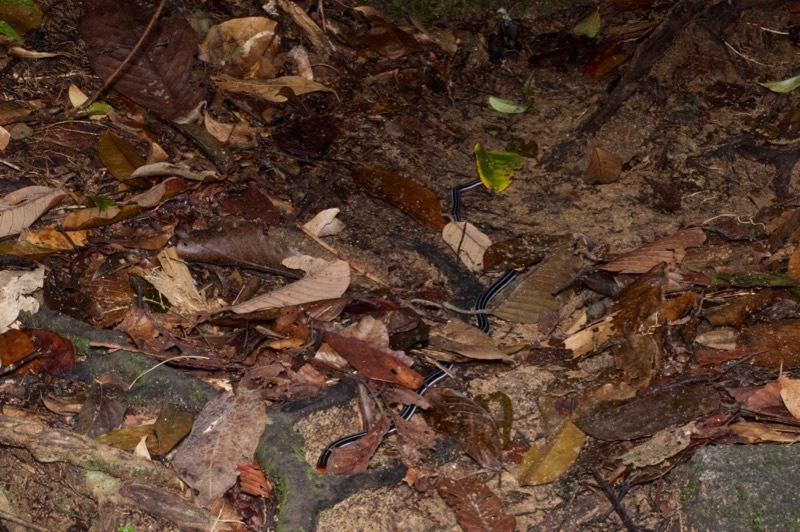 Luckily, I managed to find them during my recent trips to Borneo!!! Great job ID'ing all those animals too. 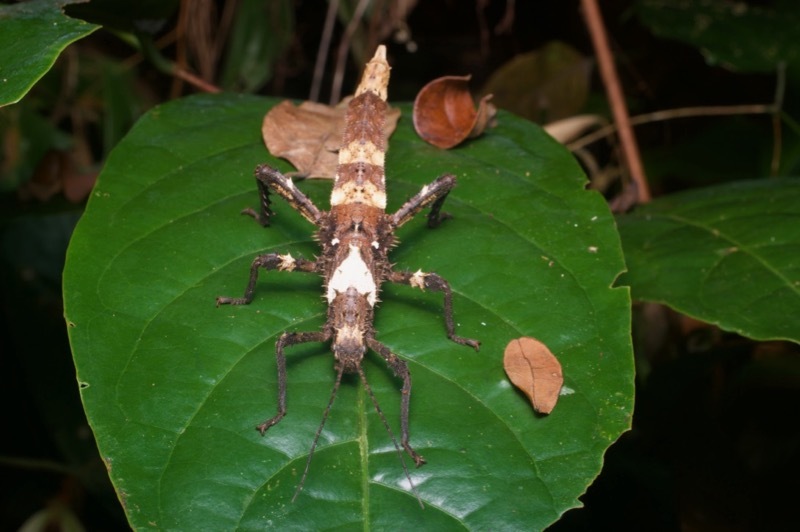 How do we differentiate between C. ingeri and C. quadrivirgatus though? 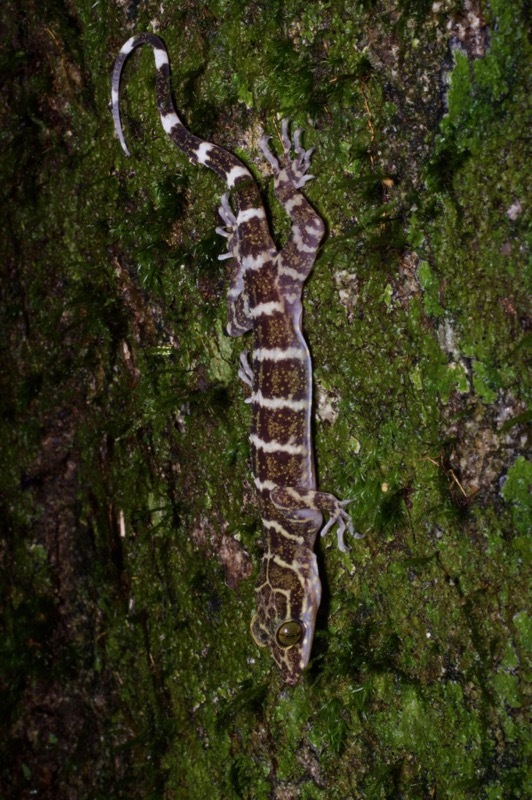 I have a 2005 article by Das about Cyrtodactylus in Borneo in a now-defunct journal/magazine called Gekko. I couldn't find a digital copy. It's got some pretty good info about the different species. 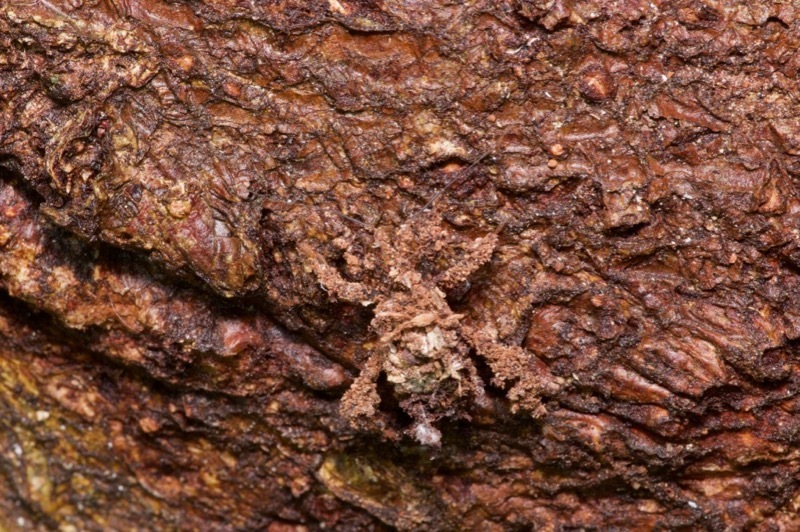 C. ingeri, yet another of the similar-looking Cyrtodactylus species, is/(was?) known only from the lowlands of Sabah and Brunei. 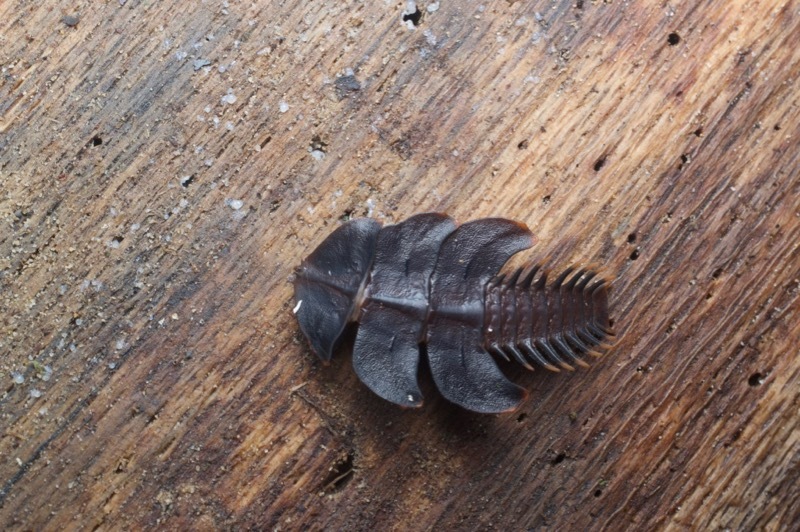 C. pubisulcus is known from Sarawak, Brunei, and southeastern Sabah. C. quadrivirgatus is/(was?) known only from a few locales in Borneo, including the base of Gunung Matang (Kubah) and the base of Gunung Gading. The dichotomous key separates the two by the presence (pubisulcus) or absence (quadrivirgatus) of a preanal groove in the males, which I unsurprisingly did not check for. But the descriptions have a number of small differences, most easily seen being the shape and arrangement of the blotches on the back. I'm confident about the ID of the C. pubisulcus here, but not really sure about the one I ID'ed as C. quadrivirgatus since it doesn't have four fully solid stripes as described. 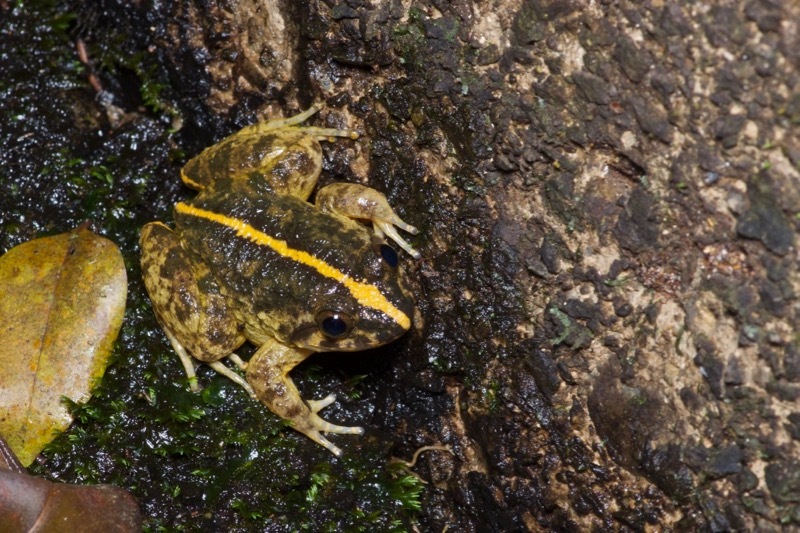 On the other hand, the one pictured in the same article doesn't quite have four solid stripes either, and it seems on the mainland that either the four solid stripes are not entirely diagnostic or there are more lurking Cyrtodactylus species waiting to be discovered. The one I pictured here has spots clearly arranged in four stripes, which seemed like enough of a clue. I could be wrong though. That states my thoughts & feelings so well that I will just recycle it. Thanks Jeroen and Jimi. That kind of feedback keeps me writing these accounts. I have now posted Part 2. 'Back to Borneo' - Congratulations, that was a quick about turn and return to Malaysia. Thanks for posting this, really enjoyed going through the photos and narrative. 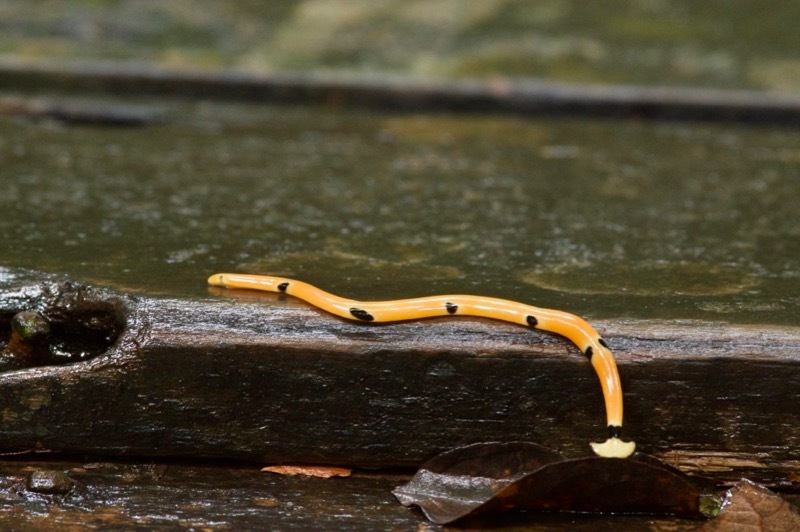 Loved the Planarian Flatworm, great colours. 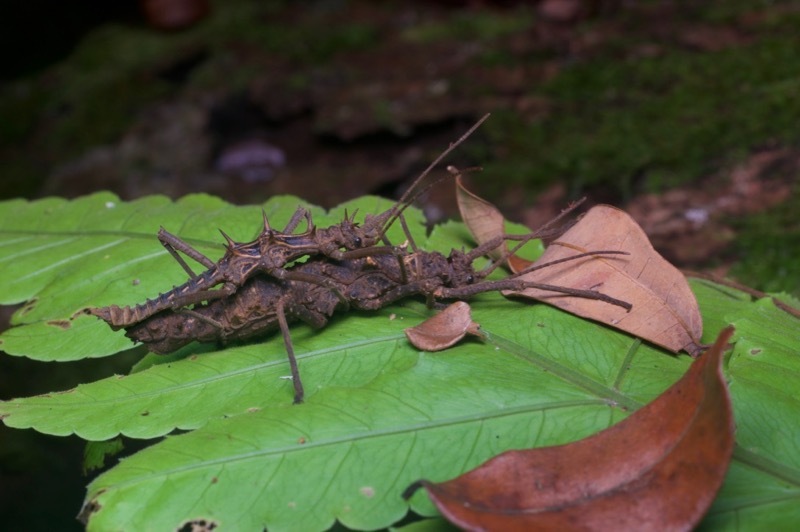 Also a fine selection of stick insects, good luck with the ID's. Great shots of the Rock Skippers. Any photographs I've taken of them are on a cheap camera or mobile phone. They always seem to inhabit the fastest parts of the streams with the most slippery, moss covered boulders. I know if I was to venture after them with my 'good camera' I'd be underwater in no time. How many nights did you spend at Kubah and how many at Gunung Gading? I think the key to getting decent photos of the Rock Skippers is to find them at night, when they are more likely to be resting on a leaf than bouncing across the stream. I was at Kubah for two nights and Gunung Gading also for two nights.